Abundant research opportunities for undergraduate and graduate students is one of the many things that draws students to the UC Santa Cruz campus. Not all students on other campuses or in other parts of the world have access to so many, and so varied, research projects. PhD student Rajan Vaish and his team have created The Aspiring Researcher Challenge to extend research opportunities to interested students around the world. In doing so, they have begun to question previous assumptions about what makes a researcher. The Aspiring Researcher Challenge is an experiment in massive open online research (MOOR). It is possible through a joint effort by Rajan’s UCSC team and the Stanford Human-Computer Interaction group. Professor James Davis at UCSC and Professor Michael Bernstein at Stanford University advise Rajan on the project. “Nothing like MOOR has ever been done before,” Vaish said. Initially, Vaish and his team had only one project and hoped to find 50 interested students. They ended up with more than 600 applications from people all over the world. Instead of turning applicants away, Vaish asked other professors if they were interested in participating. “We decided we should use this opportunity to expand,” Vaish said. "When a lot of people work together, they’re able to come up with ideas that small groups can’t." There are many students at other universities and in other countries that do not get the chance to participate in cutting-edge research but have a strong desire to get involved. Vaish hopes that this project will give them an opportunity to work with professors and researchers, and understand what it takes to produce high-quality research. Additionally, each student will walk away with a co-authorship on a research paper and letters of recommendation. Vaish explained that these letters of recommendation can greatly help students from other countries. “If they can show they’ve worked with US professors, they can get better opportunities,” he said. There are currently three projects that participants can contribute to. The first, “Computer Vision under the Assumption of Value,” is under the direction of James Davis of UCSC and Serge Belongie of Cornell University. The second allows students to work with Stanford’s Michael Bernstein on a project called “Design the Next-Generation Crowdsourcing Platform.” In the final project, “Exploring the Wisdom of Crowds,” students work with Sharad Goel of Stanford University. All of these professors were excited to work with Vaish’s idea and to allow their research to be done by crowdsourced researchers from all over the world instead of the typical small team of graduate students. “When a lot of people work together, they’re able to come up with ideas that small groups can’t,” Vaish said. Vaish’s project has gotten attention from the tech world. Notable leaders in the technology industry have volunteered to give guest lectures via webcast to participants, including Google’s Director of Research Peter Norvig, Coursera co-founder Andrew Ng, and edX President Anant Argawal. “Everyone was really excited. Participants have said to me that three months ago they could have never imagined talking to Peter Norvig,” Vaish said. 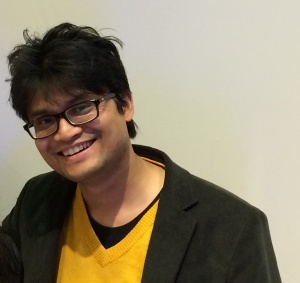 Providing opportunities to connect with real researchers is just another way Vaish and his team hope to help his participants. “It really makes us feel good that we are helping aspiring researchers realize their dreams,” he said. Shannon Bowman is a third year Linguistics student at UC Santa Cruz. Her background includes journalism, copywriting, and editing. She has also worked as a research assistant in the Language, Logic and Cognition Lab at UCSC and as a job and internship development assistant at the UC Santa Cruz Career Center. She is currently employed with the Baskin School of Engineering. After college, she hopes to find a career that will let her utilize her skills and experience.